Transport the penguin as far as possible. 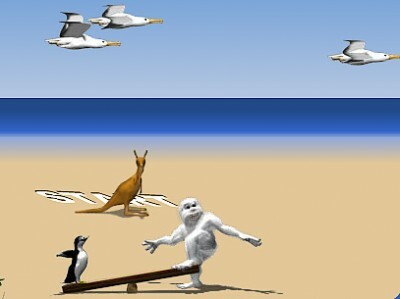 Click with the left mouse button to throw the penguin to the albatrosses. Your aim is for one of the albatrosses to catch the penguin and carry it farther. Click the left mouse button for the albatross to flap its wings. Wing flapping is more effective near the sand surface. Higher in the sky there are tricky winds. Have a nice flight!